Tile of Spain manufacturers returned once again to Italy for CERSAIE, the international exhibition of ceramic tile and bathroom furnishings. The annual 5-day event invited industry professionals to explore international manufacturers at The Europa Auditorium in Bologna. As one of the major world powers in ceramic tile production and export, Spain is a regular participant in the show. Over 90 Spanish ceramic manufacturers showcased their latest collections as a preview of what is to come for the 2019 year. 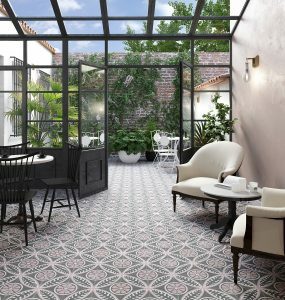 A growing trend is to look beyond structure and function when it comes to floors and walls and think decorative. 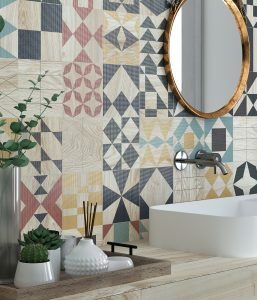 In 2019, ceramic tiles with geometric designs will play a major role in visual design of virtually every room. Inspired by the Art Deco movement of the 20s and 30s, these geometric shapes create attractive spaces and sophisticated environments while being sensitive to the nostalgia of the past eras. Doses of color that shy away from the traditional monochromatic hues convert floors and walls into the absolute protagonist of the room. These new tonalities are capable of completely transforming design by giving the allusion of a larger space while also playing on the reflections of natural light. For 2019 there are no favorite colors, but a commitment to a combination of all colors in the pursuit for more daring designs and stylistic experimentation. So long are the days of matte finishes. 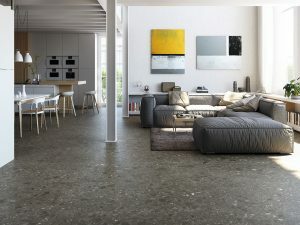 In 2019, we will see different textures and reliefs introduced in order to enhance the aesthetics of floors and walls. 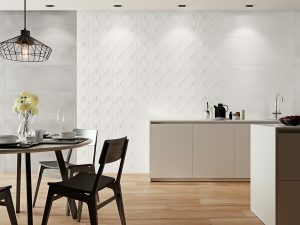 Weathered, high-gloss, volumetric, rugged and embossed finishes break the strict functionality of the material and turn ceramic tile into works of art. Collections that are based on elements from the past will still remain popular in 2019. Marble inspired ceramics that are seen year after year lend a sense of purity and infinitude. This year though, manufacturers have also lost their fear of dark tones and are releasing collections in black, green and gray hues for a more dramatic and sophisticated feel. The classically traditional Terrazzo inspired ceramics will also remain strong in 2019, but reinvents itself by experimenting with different colors, shapes and sizes to suit every project.